Can McClane’s son help him save a diminishing franchise? 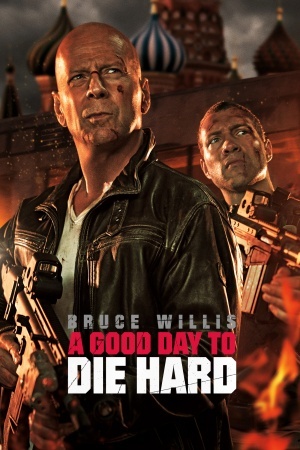 When McClane goes to Russia to make amends with his son, he discovers that the apple doesn’t fall far from the tree as the McClane’s must team up to fight their way out of the country. Continuing from Live Free or Die Hard, McClane is forced to fight for his children’s safety; this time his son is the main focus. Jack McClane is a noticeable improvement to the previous film’s Matt Farrell, who previously filled a vacant son role while the film focused on John saving his daughter. The two McClane’s make a much a formidable team, with both having a tough-guy persona and macho personalities and also provide more planned and impressive action scenes and guns- more so than McClane and Zeus in Die Hard With a Vengeance. Unfortunately the story starts to get slightly predictable towards the end despite it ticking along nicely up to this point. This is helped by continuous entertaining interaction between McClane and his son, as they attempt to fight their way out of Russia – Jack is now working for the CIA and John mocks him for it. “You’re a spy? The 007 of Plainfield, New Jersey. Very nice.” It’s this sort of tongue-in-cheek remark that brings a new flavour to the franchise with McClane’s behaviour and attitude solidifying his being just a regular cop in the wrong place, at the wrong time. The father and son bond predictably strengthens as the film goes on, pushing Jack McClane into the main character limelight more and more and creating a possible figurehead for future Die Hard films. Even though he’s pushing sixty we still see John McClane attempting some elaborate action scenes like driving off a bridge onto an eighteen-wheeler; however we now see him taking up more of a caring role and at one point even suggesting to take someone to the hospital. This allows Jack to fill the shoes of the carefree McClane character, doing whatever is needed to complete their task which is a sure shadow of eighties McClane. With such bold leads this doesn’t dampen the film and allows Jack to comfortably takeover with a young John McClane-esque performance. A Good Day to Die Hard improves on its predecessor, mainly due to the duo’s relationship and more effective on-screen dynamic. Unfortunately however, the film never manages to reach the heights of the original trilogy, largely due to their better story lines and young John McClane charisma.